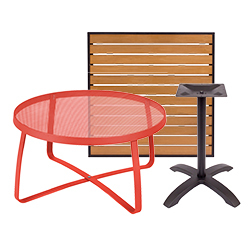 Provide a place for customers to rest their food or drinks with these outdoor tables and bases. With products ranging from casual sofas and lounges to bar stools, our selection of outdoor seating is sure to satisfy any styling need. From special events to everyday dinner service, our umbrellas and canopies are designed to keep patrons shaded and protected from the elements. 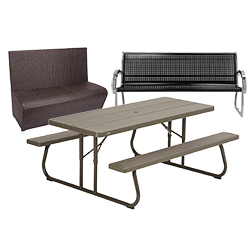 Create a casual, enticing outdoor area with these outdoor picnic tables and benches. We offer pieces in varying shapes, colors, and styles. 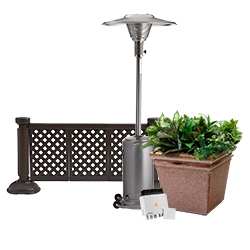 From patio heaters to commercial planters, these outdoor accessories add atmosphere and help create a more welcoming environment for guests. Regardless of the type of business you run, commercial outdoor furniture is essential for keeping guests comfortable as they enjoy your patio, deck, or rooftop. 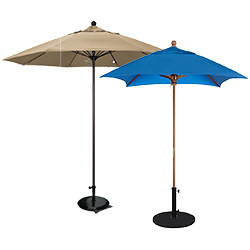 Many of our outdoor restaurant chairs and tables feature anti-microbial treatments to resist mold and mildew, and our selection of umbrellas and canopies provide protection from the sun and wind. Transform your outdoor space into a breezy, comfortable dining experience for guests with our assortment of commercial patio furniture. To find other supplies perfect for your outdoor area, check out our disposable dinnerware and tableware, plastic cups and lids, and outdoor cooking equipment. If you're wondering where to buy outdoor restaurant furniture, we have a large selection of outdoor restaurant furniture for sale at the lowest prices. Find the perfect outdoor restaurant furniture to turn your cafe patio or hotel rooftop into an outdoor oasis. Our selection of commercial patio furniture is designed to withstand natural weathering of the elements including rain, snow, sun, and wind. The wide variety of products means you’ll have everything you need from chairs and tables to umbrellas and heaters to create a cozy, inviting atmosphere. 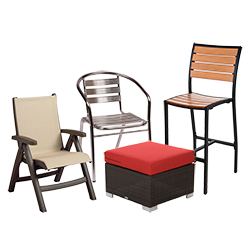 Our wide selection of outdoor seating includes chairs, bar stools, and even lounges. These are the perfect seating solution for swanky rooftop bars, casual hotel patios, and beer gardens. Add atmosphere to your seating section by including commercial planters, unobtrusive patio heaters, and fencing. Perfect for summer or warmer climates, our selection of commercial outdoor furniture includes umbrellas and canopies that can keep customers and guests protected from the sun. Spruce up your unused outdoor area by incorporating this outdoor restaurant furniture into your establishment’s decor.